We made it back from our vacation, it was a cold wet week but we had a good time anyway,leave it to us to go fishing on our time off. We are starting to feel fall in the air here, Sue and the kids are getting ready to go back to school and I am trying to catch up on some projects. I finished putting sliding glass doors into cabin 2, put a new roof on cabin 6 and will be starting a shed tommorrow. Chad has started preparing for the bear hunt for me, putting baits out, clearing trails etc. , the bear are very active right now, should be a good hunt. I am also enjoying the company of Wendy and Dianne some of the people I was coming to Paquette's Camp with before I came to stay! Great to see you guys, and nice of you to bring Ed with you as well, haven't seen him in 25 years. Would also like to thank Kim and Corey for sending me pictures of her big fish so I can share it with everyone. Ed had a good day for his first on his first Pike fishing excursion, probably won't be his last! 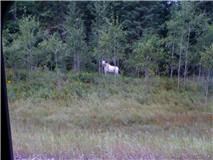 On our way to take Ryan to the airport in Timmins we were blessed to see this White Moose. There is a small population of them in the area around Foleyet, about 1 hour from the camp. Kim's dad Carl releasing her big fish so someone else can have the excitement of cathcing it. Way to go! Kim landed this big Pike while on a day trip from Paquette's Camp. Nice fish Kim. The past week included all of the normal things such as Fishing , Kayaking, Relaxing etc, but the highlight of the week was the Lew-Wow. It was decided to have a Hawaian night, what a great success ! They even named it in my honor. The weather was perfect it was hot and sunny all week, it even felt like Hawaii! Everyone joined in with the fun. Tammy, Marylin, Crissy, and Emily were the organisers, THEY DID A GREAT JOB. A special thanks them and everyone else that made it a success. Can't wait for next years ! ps. Sorry I could not get everyone in the pictures below, mabye next year. We are closed this week so that we can enjoy some time with our family, believe it or not we are going into a fishing camp that Sue and her siblings helped her Dad build from the ground up. Myself and many of the others have never been there,too bad Sue's dad could not be around for it , sure there will be many memories of him while we are there. No one from the family has been there since he passed away 15 years ago, I'm sure it will be a great experience! Well its my turn to be on vacation will update when I get back. The Lew-Wow begins, wasn't sure I liked the name Ryan came up with for it, but what a party, notice it says 1st annual, can't wait until next year, don't miss it! Looks like I died and went to heaven! Who would of thought, a Tiki Bar on a Canadian fishing trip. ***** happens at Paquette's Camp! They look like big tough guys, but they are all wearing flowers! Helen and Renae soak up the sun and fun. The canoe races are on, good luck on staying dry! but the food is great, Thanks to Denny and the whole group for the feast! The sun may be going down, but the party is still going strong, Looks like a Hawian sunset to me! 6 Kayaks went out , finaly figured out where Denny is with his, guess someone has to take the picture. Looks like the fishing is good today! The past week has been very busy, there were certainly more bloopers this week , but we will save them for another time, It was really nice to see the whole Goeckel group again, along with Dara, Carl's granddaughter on her first trip here. It was also great to see Dave, Gretchen, Ben, Abby, and Sy along with Sampson their 195 pound Bull Mastiff, If he wasn't such a big baby I might be scared of him. Joe and his crew were up this week it has been 7 years since they have been up, and we hope it will not be that long till we see them again. Terry was up for the first time in a few years, ( he has some of the bloopers this week) It was nice rehashing some of the stories of years past with him, and we hope we can have many more stories in the future. And last but not least was Tracy and his group who we have seen every year for at least the last 20, hope it will be another 20. My highlight of the week was Friday when my stepson Ryan arrived, he will be here for 2 weeks, I plan to get some fishing in with him and enjoy having him here, it is great to have the whole family together again! This week brings a full camp, there will be many campfires with the Fewins, Fain, and Miller groups (looks like I better go cut some more wood). 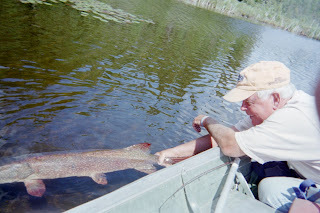 The weather is warm and sunny, don't know what that will do for the fishing, but it is great for the sun worshipers, swimmers, and the kayakers and there will be a lot of that going on this week. There is a Hawian night planned for tomorrow night , don't know what that involves, but then again I am not on the planning team, sure it will involve fancy drinks etc. Well I'm off to go fishing with Ryan, hope to have fresh fish for supper. Wish me Luck! Quick take the picture I don't know how long I can hold it! Nice fish Andrew! The Fireweed is in full bloom adding a lot of color alongside the roads, just something else to add beauty to an already great place! Well a start of another week, lets see if I can remember all of their names. There's Harold, Cathy, Ranae , Chuck, Mary , Mark , Julie, and Dan and then there's Moose, Weiner, Craig , Jake, Sarah, Brad, Larry , Ryan, Denny, Tammy, Paul , Marylin, Adam, Helen, and the newcomer Nate. Sorry if I missed anyone. Here is one of out camp "dogs" (actually a red fox) coming around for a handout, looks like he was successful I can see he has a mouth full. Looks like Aaron is trying to take credit for his wife Karen's fish. 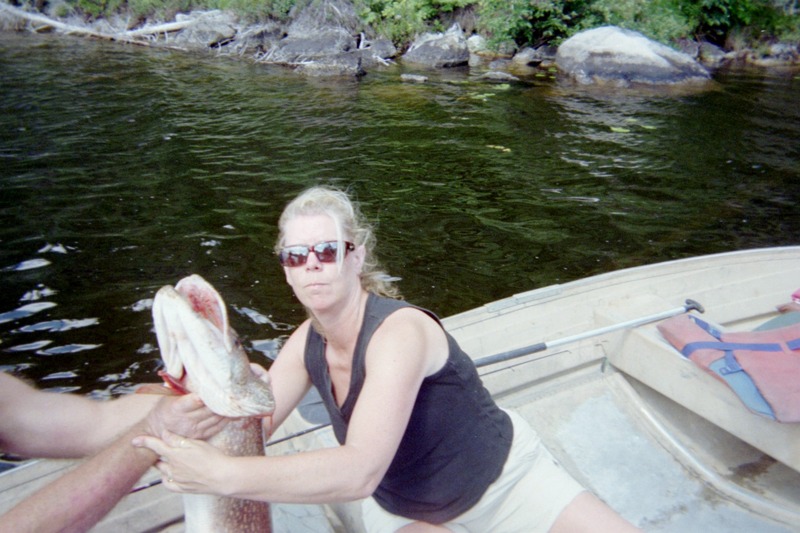 Nice fish Karen, we all know you were the one who caught it! Arron was fishing with his kids Andrew and Anna on Wangoon Lake when they caught these nice Small Mouth, to bad dad can not catch something this big. Too bad you are going home tomorrow, it's been a fast 3 weeks. It looks like you have a nice mess of fish to take with you though!